Katherine Paulson focuses her practice on complex litigation and has considerable experience in a broad range of areas, including antitrust, products liability, class actions, commercial disputes, fraud and real estate matters. 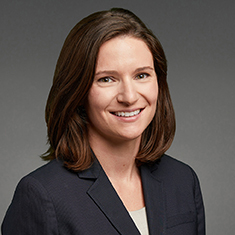 Her antitrust experience also includes counseling clients on the antitrust aspects of potential mergers and acquisitions, conducting internal investigations and developing antitrust best practices. She has represented clients in both state and federal courts across the country and has experience with multidistrict litigation. Shown below is a selection of Katherine’s engagements.